The Dallas Police Department is investigating the attack as a possible hate crime, though trans people are not explicitly protected under Texas hate crime law. 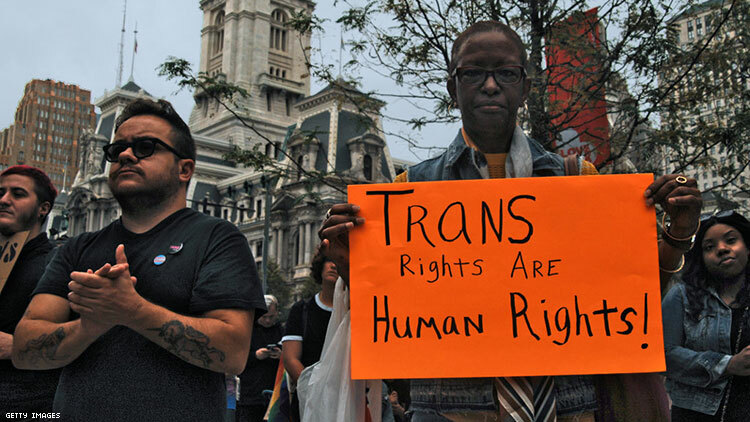 A trans woman was brutally attacked over the weekend — indicative of the alarming rates of violence that trans women, specifically Black trans women, face even as LGBTQ+ acceptance and visibility are at an all-time high. The woman, whom Out has chosen not to identify, was attacked by a group of men outside of an apartment complex in Dallas after a minor traffic accident, the Associated Press reports. Purported video footage of the incident posted on Facebook shows one man, and then multiple men, beating the woman unconscious as a crowd looks on, shouting homophobic and misogynistic slurs. "Officers spoke with the victim, a transgender female, who had been assaulted by known suspects," said the Dallas Police Department in a statement, per BuzzFeed News. "The victim stated that the suspects used homophobic slurs during the assault." The Dallas Police Department is investigating the attack as a possible hate crime. Trans people are not explicitly protected by hate crime laws in Texas as the state’s hate crime laws only cover sexual orientation, not gender identity. More than 7,000 hate crimes were committed in the United States in 2017, the AP notes, over a thousand of which targeted individuals for their queer or trans identity, real or perceived. There were 52 anti-LGBTQ+ homicides that year, per the National Coalition of Anti-Violence Programs, 27 of which involved trans and gender nonconforming victims, 22 of whom were of color. “The time for addressing this crisis of violence is now,” says the NCAVP in its annual report on anti-LGBTQ+ hate violence.